I’ve lived on Ambergris Caye in Belize for nearly nine years, but have never tired of watching the Caribbean’s powerful waves crash on the offshore barrier reef, creating a continuous fanfare of exploding sea spray. After their tumultuous encounter with the reef line, the waves flow serenely towards the shoreline and eventually roll onto the soft sand beach. My husband, Mike, and I live a few blocks from the beach, so we regularly head to a favorite spot where we can relax and relish our favorite aquatic scene. On Sunday mornings, we drop in to Ramon’s Village for a leisurely cappuccino, which we enjoy while sitting on their inviting open-air seaside deck. I can’t imagine a better spot to sink into a cushy chair… sip a frothy cappuccino made with a deep, dark Guatemalan blend… and meditate on the shifting shades of the vivid turquoise seascape. Ramon’s Village is an iconic resort built in the classic Belizean palapa style (open-sided with a thatched roof). The design is traditional, but Ramon’s has otherwise kept up with the times. A few years ago, the American owner imported an impressive espresso machine. It’s grand enough to take me back to my past life in the San Francisco Bay Area—espresso heaven. The owner also brought a professional barista to the island to train his staff. We put in our order, chat it up with Alex, and then step out onto Ramon’s open-air deck. There’s never a shortage of cushy deck chairs, all with a direct view of the beach, the reef, and the dive boats on their way out to an exciting scuba diving excursion. The deck’s only a few feet above sea level, with a sturdy wood railing, a perfect spot to prop our feet up and settle in. I love the tranquility of Sunday mornings at Ramon’s. It’s a time when I can enjoy my cappuccino while escaping into an aquamarine seaside reverie. Peace engulfs me as I gaze out over the Caribbean Sea, and am reminded of the fantastic sea creatures living amongst the reef’s coral. It’s a special time when Mike and I simply relish the spectacular environment that surrounds us. Within a few short hours, the beach will be buzzing with activity. After all, Sunday afternoons are when you’ll find barbecues and live music on the beach. Sunday isn’t the only time I sneak out to Ramon’s for a seascape break. On the days a friend and I do yoga, I often suggest we escape to Ramon’s after class. It’s our go-to seaside coffee house. We catch up on the latest island gossip while enjoying our espressos. The intense turquoise sea provides a soothing backdrop for any gab session. There are few places in the world where you’ll find this breathtaking view. 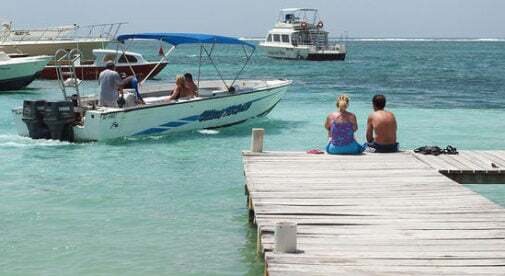 That’s why Ambergris Caye continues to gain popularity. If you drop by Ramon’s, a cappuccino will set you back $4.50…but the million-dollar view is free.